Jubilant Valtteri Bottas raises the cup high after his first ever Formula One win at the Russian Grand Prix. Mercedes driver Valtteri Bottas claimed his first-ever Formula One victory at the Russian Grand Prix overnight. Bottas, parachuted into the Mercedes team in January after the surprise retirement of defending champion Nico Rosberg, has struggled to come to terms with his new car in the opening three races of the season. But in Russia Bottas showed his Finnish trademark cool-headedness. He saw off Sebastian Vettel’s fast finishing Ferrari in a thrilling contest that saw him win by just 0.6 seconds. Bottas now becomes the third different winner in four races this season, while manufacturers Mercedes and Ferrari are tied at two wins apiece in what is shaping up to be an epic battle for the World Championship. The day began on the back foot for the Mercedes team with archrival Ferrari securing their first 1-2 grid position lockout since the 2008 French Grand Prix. But Bottas got a blistering start from third place to pass the two Ferraris by the first corner. Utilising the clean air out in front on a surprisingly hot 40-degree day in Sochi, Bottas continued to pull away from his rivals, the gap peaking on lap 20 at 5.5 seconds. The Mercedes team called their driver into the pits to change tyres on lap 27 of the 54-lap race, but Ferrari left Vettel out an extra seven laps before pitting him. On tyres seven laps younger, Vettel began to drag the deficit back to the Finn, getting to within a second to set up a spectacular finish. Bottas momentarily lost his composure under pressure, locking up both front wheels – raising concerns the flat-spotted tyres would cause vibrations that would ruin the chances of the young Mercedes driver to defend his position. But Bottas held both his car and his nerve together to see off the Ferrari challenge and secure his maiden victory. 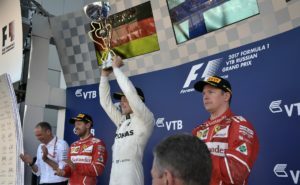 Vettel’s Ferrari team mate Kimi Raikkonen took the final podium position in third place, while three-time World Champion Lewis Hamilton had a lonely race in fourth place in the other Mercedes, complaining on the radio of overheating issues.